fLOW is a site-specific work-in-progress that was started under ever-changing titles in October 1998. The entire project is carried out in numerous steps and takes place in various location with changing musicians from different fields like New Music, experimental jazz, free improvisation and New Electronic Music. fLAME is the 20th realisation within this project written for a performance with the British composer and improviser Richard Barrett. This piece is based on a time score of two parts (determining the sequence of pre-defined sound and structure types in time) where the one layer is the exact retrograde of the other. By this, the relationship between the two performers changes gradually during the piece: in the beginning, Karlheinz Essl starts with the sound scape of fLOW (using "water" material) which is commented by short solistic actions of Richard Barrett. At the end, the sound scape is played by Barrett (this time transformed into "fire" material), whereas Essl acts as a soloist. The piece is composed of 4 different structure types that occur in 4 variants. Each variant has a different duration (1', 1'30", 2'30" or 4') and uses another sound material. A variant is characterised by the alternation of a musical phrase followed by a period of silence. The duration of phrases and silences is not precisely determined and can be chosen spontanousely by the performer according to the evolving situation and the given global indications. Long sustained sounds with slow crescendo and decrescendo which stay in the same register. Long phrases, short silences. Character: stable, supportive, grounded. Repeated sounds that form a rhythmical grid. Several grids can be superimposed. Phrases and silences of different lengths. Character: energetic, powerful, driving, moving onward. Pointillistic and expressive eruptions with sudden changing parameters forming phrases of different lengths, separated by pauses of variable durations. Character: nervous, eloquent, dynamic, tense, complex, orgasmic. Character: cold; flowing, dripping, streaming, vaporizing. Character: cool; dark, dumpf, heavy, dense. Character: hot; light, crickling, burning. 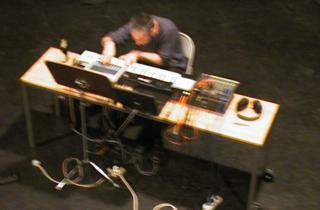 The performance of fLOW takes advantage of the following electronic equipment: Richard Barrett uses a G3 PowerBook with the STEIM software LISA together with a MIDI keyboard and a MIDI controller. 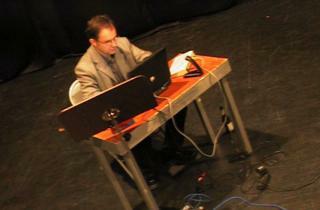 Karlheinz Essl plays his realtime composition environment m@ze°2 on a G3 PowerBook and a Roland MCR-8 MIDI controller. Komponist und Elektronik-Performer. Studien: Genetik, Komposition (Peter Wiegold). Gewann 1986 den angesehenen "Kranichsteiner Musikpreis" der Darmstädter Ferienkurse für Neue Musik und den "Gaudeamus-Preis" (Amsterdam 1989) für junge Komponisten. 1984 Gründung des "Ensemble Exposé". Neben seiner kompositorischen Tätigkeit tritt er mit Paul Obermayer im Improvisationsduo FURT auch als Live-Performer von elektronischer Musik hervor, daneben auch als Mitspieler von George Lewis und Evan Parker. Unterrichtet elektronische Musik am Konservatorium in Den Haag. Lebt in Amsterdam. Komponist und Elektronik-Performer. Studierte Musikwissenschaft und Komposition in Wien. 1990-94 "Composer in residence" bei den Darmstädter Ferienkursen für Neue Musik,1992/93 Realisierung eines Kompositionsauftrages am IRCAM in Paris. Unterrichtet "Computermusik" am Studio for Advanced Music & Media Technology (SAMT) der Anton Bruckner Privatuniversität in Linz. Komponiert Instrumentalwerke, elektronische Musik, interaktive Klanginstallationen, intermediale und Internet-Projekte. Tätigkeit als Performer im Bereich der Live-Elektronik. Zahlreiche Aufführungen im In- und Ausland. Internationale Zusammenarbeit mit den wichtigsten Ensembles für Neue Musik. 1996 Portraitkonzerte bei den Salzburger Festspielen. Lebt in Klosterneuburg bei Wien.